Learners at Bridgend College have once again been recognised for a highly esteemed award. 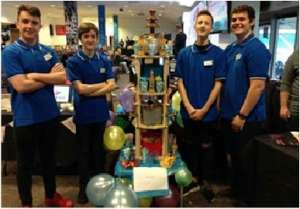 Skilled students from the Plumbing department worked together to develop the ‘Fun Fountain’, promoted as part of the Welsh Baccalaureate Enterprise and Employability Challenge. The ‘Party Plumbers’, as they became known, were thrilled to have their plumbing and design skills praised so highly. The Welsh Baccalaureate’s Enterprise and Employability Challenge provides various opportunities for learners to develop enterprising skills. This includes numeracy, creativity, digital literacy and personal effectiveness. It was amazing because the team had taken their research seriously, the accompanying business planning was excellent too. Well done to The Party Plumbers – James Price, Cameron Griffiths, Mitchel Wyllis and Ben Greene!